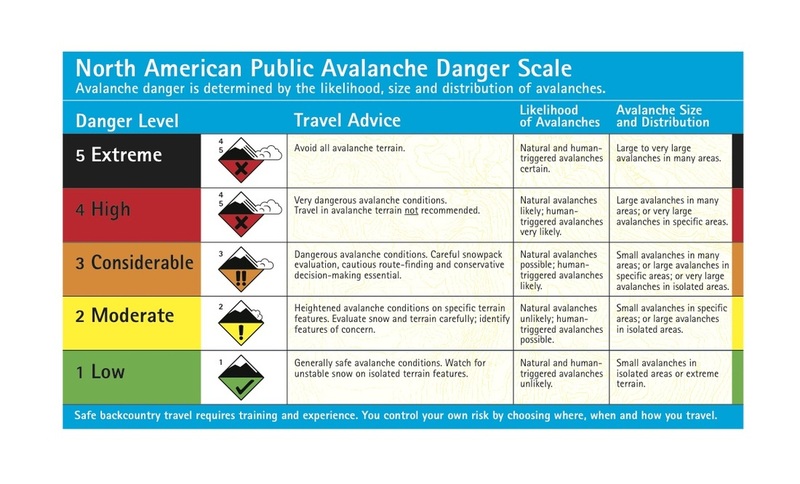 Below is the North American Public Avalanche Danger Scale, which offers explanations of the danger levels and what each means. These are the ratings you will find on avalanche advisories. As well, many advisories will use the avalanche danger rose. National Ski Patrol (NSP) Southern California: Offer Level I and II courses in So Cal. Also work with partner instructors in the Sierra. Wilderness Leadership Institute (WLI): A San Diego based resource for outdoor education and custom education opportunities. Sierra Mountain Guides (SMG): A great resource for AVI 1 and 2 courses in the Sierra. Sierra Mountain Center (SMC): Another guide service in the Sierra offering avalanche courses. Mammut Avalanche Blog: A bit of favoritism towards Mammut products, but a good resource for current avalanche happenings. Also a good resource for accident summaries, as well as links to more detailed incident reports. AAA Education Progression: Suggested educational flowchart published by the American Avalanche Association. Backcountry Access Education: A great resource for research and information about safety. Check out their in-depth studies on effective digging! Wildsnow.com - The Backcountry Skiing Blog: A comprehensive, up-to-date blog for backcountry skiing. Click on the Avalanche tab for all kinds of great articles.